I’ve missed you! I have been busy eating garbage food since Thanksgiving (just being honest here) and so I had no new recipes to share with you. I decided to get my act together for the new year, so I started a THM Fuel Cycle. It’s just a more pure version of the THM eating plan, minus cheese and nuts, and with a set way to eat for two weeks. You can learn all about it in Chapter 28. I always find myself struggling on the fuel pull days. Those of you familiar with the plan will know what I mean. Fuel pull means no significant source of carbs OR fat. You are really asking your body to burn up your own stores. Food choices get really limited and meals can become challenging. Pre-heat the oven to 400°. Mix the chicken, kale, tomato, garlic, balsamic dressing and seasonings in a medium bowl until well combined. Set aside and let it marinate while the oven heats up. Spread the laughing cow cheese over the pita and place it on a baking sheet. Pile the yummy chicken and veggies on top. Bake for 12-15 minutes until the pita is crispy and everything has had a chance to get nice and toasty. I called this a pizza, but in reality, you will probably need a fork to eat it. 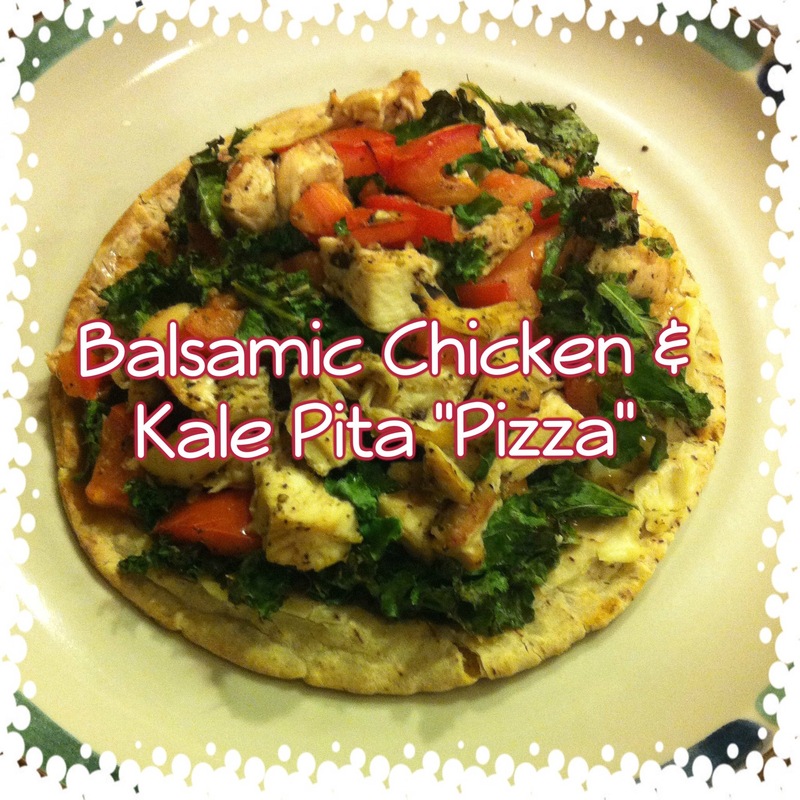 It was scrumptious and my hubby loved it…he ate TWO! To make this an S, add real mozzarella or other cheese on top. You could probably also add olives for added flavor. To make this an E, you could ditch the pita and use Gwen’s easy bread dough for the crust. I would pre-bake the crust and then proceed as planned.